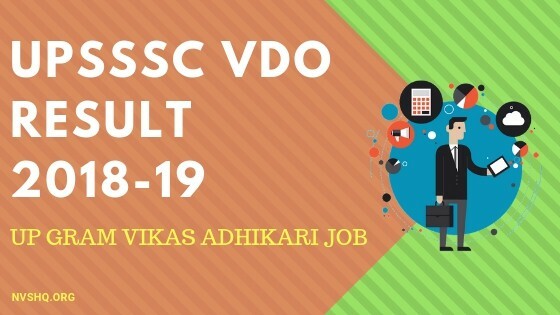 UPSSSC VDO result 2018-2019 of Gram Vikas Adhikari (VDO) is expected to release in month of march 2019. You can check VDO result 2019 through direct link we will upload here. UPSSSC VDO written exam for the post of Village Development Officer (VDO) and other posts was conducted successfully in the month of December 2018. Now, all the examines are waiting for announcement of VDO result 2019, cut off and merit list. Uttar Pradesh Subordinate Service Selection Commission (UPSSSC) is the authority responsible for conducting these exams in Uttar Pradesh state and releasing UPSSSC VDO Result 2018-2019.A large number of candidates have appeared in the written exam i.e. 9.5 Lakh. All the candidates selected in the first round will be invited for the next round i.e. interview. In this article, readers or all the candidates who are eager to know the scorecard will get all the necessary details about the result, merit list and cut off marks list. UPSSSC VDO result 2018-2019 for the written exams conducted in the month of December 2018 is going to release soon. Board will publish the VDO result on its official website. No result will be sent individually to any candidate through post or any other medium. UPSSSC will notify all the candidates about the declaration of VDO result 2018-19 through its official website. All the candidates are therefore advised to stay in touch with the official portal of UPSSSC. Result will be published in a PDF form that will indicate the roll number of all the qualified candidates who will be shortlisted for the next selection round. All the selected candidates will be called for the interview round. Along with the roll no. of the shortlisted candidates, result PDF will also include the important instructions regarding the interview round. Candidates have to read all these instructions carefully. Candidates have to check the result from UPSSSC portal. To help them in this, we have shared the complete procedure to check the result here. Visit the official website of UPSSSC (www.upsssc.gov.in) first. Candidates can also click on the direct link shared below. On the homepage, they have to search for result link. Candidates have to select for VDO result link. Result login window will appear. Enter the required login details. Download the result PDF for future references. After the declaration of result, UPSSSC will declare the merit list of the candidates. Merit list will be prepared on the basis of marks obtained by the candidates in the exam. Conducting authority will also publish the result in PDF form that will include names of the candidates in the order of their merit. The final merit list will be prepared on the basis of marks and performance of the candidates in written test and interview. As soon as merit list will be published on the official website we will also share the same here. UPSSC will also declare the cutoff marks list for the year 2018 after the announcement of result. Cut off marks is the minimum mark required by the candidate to qualify an exam. UPSSSC VDO cut off marks will be prepared on the basis of number of candidates appearing in exam, level of difficulty of exam, marking scheme, number/availability of seats etc. Every year these factors changes and thus the cut off marks keeps on changing. Here we have shared the previous year cut off and Expected cut off marks to provide candidates an idea about UPSSSC VDO 2019 cut off marks. On the basis of number of candidates appeared in the exam, difficulty level of exam and considering other necessary factor we have prepared an expected cut off marks for VDO 2018 examination. The official cut off marks may vary from the aforementioned cut off. As soon as UPSSSC will declare the cut off we will update the same here. Stay connected for all the information about UPSSSC VDO written examination result. Share your queries and doubts regarding VDO result 2019 and other posts with us through the comment section below. Our expert team will reply ASAP. All the best for UPSSSC result!!!!! Sir vdo 2018 ka results KB tk aayega . Sir ji VDO ka result kb tk ayega. Ayega bhi ya nahi. sir vdo ka result kb tk aaiyega …aap fix date bata do…mughe …. Gen ki marit bataiye ….girls ki alag jati h kya marit…. Sir VDO ka regelt kab ayega election se pahle ya Baad me please koi conform date bataye. Election k baad hi aane ki ummid hai. Sabse pahle tubel oprater ka aaye ga jo ki date 13 |04|2019 se 22|04|2019 bich me aajaye ga fir uske bad Vdo ka 23|04|2019 se 30|04|2019 tak aa jaye ga.
VDO ka result kb aa rha h aapne March me dal rkha tha ab to April start ho gya h.
Agar kisi candidate ne exam december 2018 me diya hai aur CCC February mein clear kiya hai.. Aur uska VDO clear ho jata hai to wo eligible hai VDO k liye??? 84+ days pass away “vdo result” ? Sir,vdo me interview hoga kya????? Is month me aane ki ummid hai. Is month k last tk aane ki ummid hai. Sir vdo ka result kb Tak ayega? after 70+ days upsssc VDO ka result nahi aaya shame on UPSSSC & UP Government. Sir ex servicemen Ka cut off kya ho ga.